Everyone over age 50 should have a colonoscopy — and sooner if there is a history of colorectal cancer in your family. Early screening would prevent 90 percent of colon cancer cases, the third most common form of cancer in the U.S. Men and women face the same risk, and the most common symptom is no symptom at all. There are lots of good reasons to schedule a colonoscopy — for you and those you love. A colonoscopy is a test that uses a long skinny flexible tube, about ¾ inches wide, to look into the colon. The instrument that is used to examine your colon is called a colonoscope. The scope has a miniature TV camera in it that allows your doctor to view the inside of your colon. If you are over 50 or have a family history of colorectal cancer, talk to your doctor about getting screened. Call (206) 223-2319 for more information or to schedule an appointment. Why get a colonoscopy at Virginia Mason? Providers at Virginia Mason performed over 10,000 colonoscopies in 2017. During your colonoscopy, your doctor will look for benign (harmless) growths called polyps or adenomas. Most people with adenomas don’t know they have them because they feel no symptoms. But because adenomas can lead to colon cancer if left untreated, your doctor will search for adenomas during your colonoscopy and remove them if found. The national target rate for detecting adenomas is 20 percent for women and 30 percent for men. 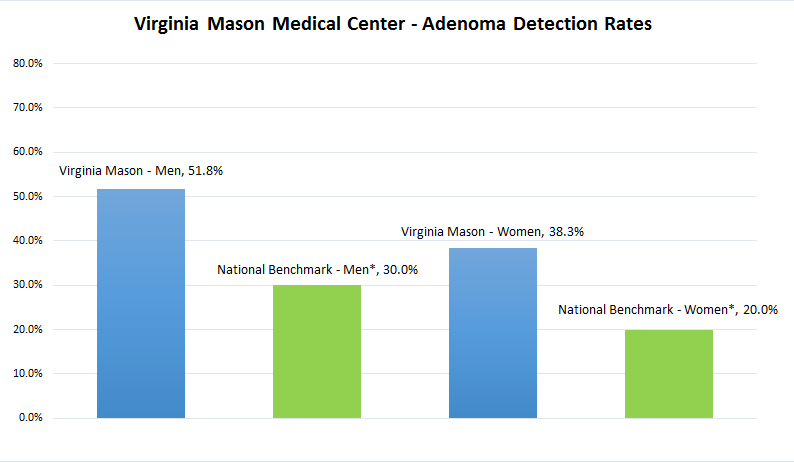 Here at Virginia Mason, the adenoma detection rate is much higher. In fact, it is nearly double the national target rate for women and more than 60 percent higher for men. This means that if you have an adenoma in your colon, your doctor at Virginia Mason has a much better chance of seeing and treating it — and you will be getting the highest quality care available. Colonoscopy completion refers to whether or not your physician can visualize your entire large intestine during your colonoscopy procedure. Factors that prevent colonoscopy completion include poor bowel preparation, obstruction of your intestine by colonic disease or lack of physician expertise. 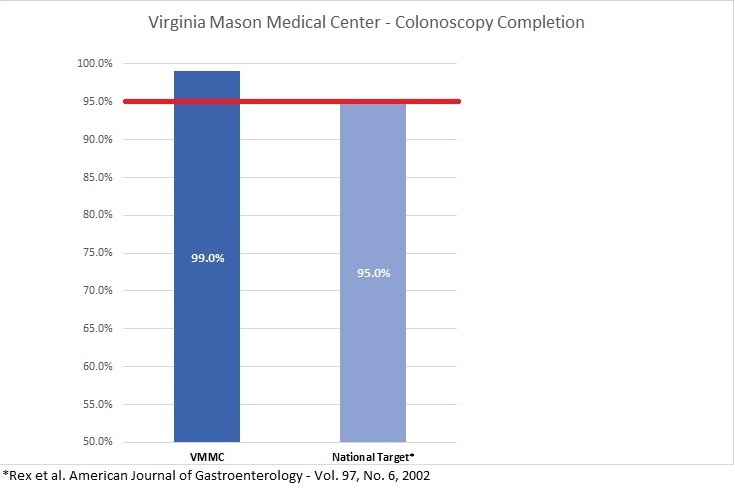 At Virginia Mason, physicians have a 99 percent colonoscopy completion rate, compared to the national target of 95 percent—an indicator that as our patient, you will receive the highest quality care available. You will be given written instructions for the colon prep (colonoscopy prep planner) that will include diet and laxative information. Please review this prep planner in advance. It is quite normal that you might experience some mild to moderate abdominal cramping for about one to two hours after the preparation. Rest, relaxation, Tylenol and the use of heating pad or hot water bottle will help reduce this discomfort. The colon must be completely clean so that your physician can evaluate the entire colon and not miss something important. Please follow the instructions of your prep planner closely and call if you have any questions. Failure to follow these instructions may cause the colon to not be clean enough. If this happens you will be asked to reschedule the appointment. You will have a chance to meet with the doctor in the procedure room. He/she will discuss your concerns and explain the risks and benefits of the procedure. The doctor will then start putting some sedation medication in your IV. This medication is given to relax you and allow you to rest during the exam. Most people get sleepy, drowsy, relaxed and forgetful, but you will not become unconscious. It is not unusual for you to experience mild, brief discomfort in the form of cramps or gas-type pains. If you are uncomfortable during the procedure, you can be given more medication if it is safe to do so. The nurse will constantly monitor you and give you medication as you need it. The procedure takes about 20 to 40 minutes. If your doctor sees any polyps or thinks that an area needs further evaluation, he/she will pass an instrument through the colonoscope to remove the polyp or take a biopsy (a small sample of the colon lining). This tissue will be sent to the lab to be analyzed. Removing a polyp or taking a small biopsy will not cause you pain or discomfort. You will be notified of the lab results in about 10 days. For quality improvement purposes, the Digestive Disease Institute tracks the polyp (adenoma) detection rate for screening and surveillance patients, which is currently at 31.93 percent. Colonoscopy is generally safe procedure. Research studies have shown that the complication rate is approximately 1 in 1,000. One possible complication is a perforation, or tear, through the bowel wall that could require surgery. Bleeding might occur at the site of biopsy or polypectomy, but it's usually minor. Bleeding can stop on its own or be controlled through the colonoscope; it rarely requires follow-up treatment. Some patients might have a reaction to sedative or complication from heart or lung disease. Colonoscopy is about 90-95 percent accurate because of "blind areas" in the colon. It is important to not ignore new symptoms in the future. You may need another colonoscopy at that time. Virginia Mason offers colonoscopy screening at several locations throughout the region. Talk to your health care provider about getting a colonoscopy screening, and learn more about all the preventive screenings recommended for your age group. Call (206) 223-2319 for more information or to schedule an appointment.